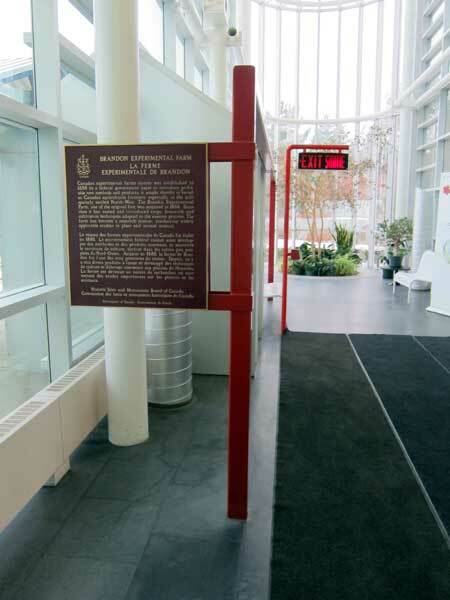 A monument in the foyer of the present Brandon Experimental Farm main building was originally erected in 1982 by the Historic Sites and Monuments Board of Canada. It commemorates Canada’s experimental farms system that was established in 1886 by a federal government eager to introduce profitable new methods and products. It sought thereby to broaden Canada’s agricultural frontiers, especially in the still sparsely settled North-West. The Brandon Experimental Farm, one of the original five, was acquired in 1888. Since then it has tested and introduced crops, livestock and cultivation techniques adapted to the eastern prairies. The farm has become a research station, conducting widely applicable studies in plant and animal science. 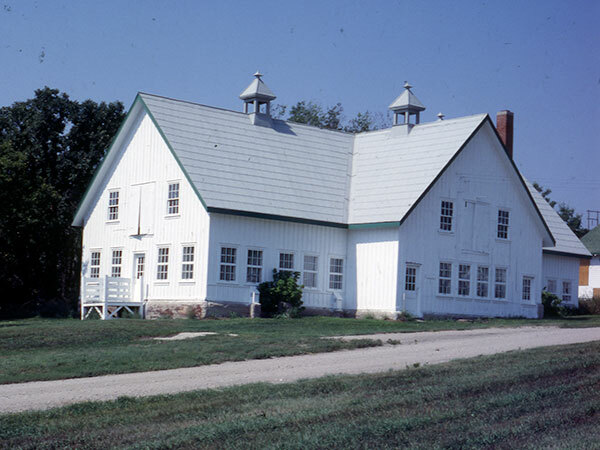 Around 1981, a dairy barn and swine barn at the site was featured in a Manitoba Co-operator series on rural architecture. The original captions for the two photograph are given below. This is a smart barn. Has been for almost 65 years. Originally constructed in 1917 as a dairy barn at Agriculture Canada’s Brandon research station, the building has since been a part of Canada’s effort to improve agriculture production in Western Canada. 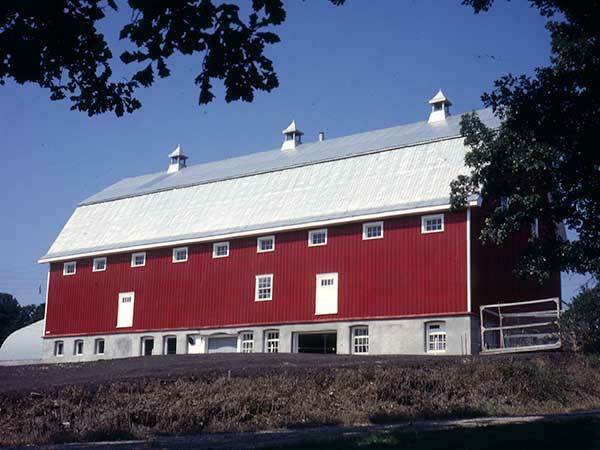 It is one of the longest barns in this province, measuring 112 feet in length and 50 feet wide. With a connected milk house and storage area, it has an estimated 17,600 square feet of floor space in the lower, main and loft area. As well, there is a silo behind the barn measuring 12 feet across by 23 feet high. Another barn was originally built on this site (in 1910) which is tucked into the north slope of the Brandon Hills. The original structure was destroyed by fire about five years later. The foundation and main floor area survived in relatively good condition and the present superstructure was added in 1917 at a cost of $57,000. It was used mainly as housing for the dairy herd of milking Shorthorns until the late 1940s when, like most other barns on the Prairies, it took on new duties. The lower portion was used as an isolation unit for sick animals and the upper area for grinding and mixing swine and cattle rations. For the last decade the barn has served mainly as a carpenter shop, threshing room and drying room. As would be expected of a government facility, the structure is in excellent condition through regular maintenance. It can also be said to have maintained its direct link with crop research through the threshing and storage production from the station’s valuable test plots. This is one of the few agricultural research buildings in the province to remain in its original form, even though its utilization has changed over the years. Built in 1913 as a swine-farrowing facility at Agriculture Canada’s research station in Brandon, the T-shaped barn cost the government $18,500 to construct, a tidy sum for such a building even in those days. It is used now mainly for equipment storage. Composed of two wings each 31 feet by 81 feet and a front section 20 feet by 10 feet, the structure was one of the most modern of its type at time of construction.